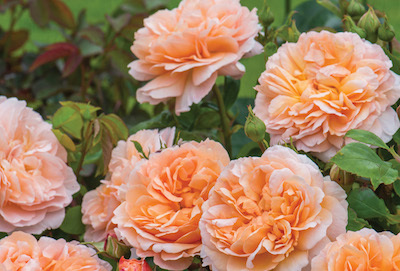 Each spring, David Austin Roses in England introduces several new English Roses in North America that are especially suited to perform in the broad range of American and Canadian growing conditions. For Spring 2015, the Austin team has selected four: an intensely-fragrant, apricot-coloredrose that re-blooms fast and furiously all season; Austin’s first pink repeat-blooming rambler rose bred for shorter length; a shrubby, fragrant red rose that’s perfect for informal settings; and an especially fragrant clear pink rose that repeat blooms quickly producing waves of flowers from early summer through frost. Each offers attributes that will excite rose lovers of all stripes. Following are descriptions of the 2015 introductions from David Austin’s senior rosarian Michael Marriott. For more on these and all 132 English Roses available to U.S. and Canadian gardeners see www.davidaustinroses.com. ‘The Lady Gardener’ – This gorgeous apricot-colored rose is intensely fragrant, notably quick to repeat-bloom and produces a staggering number of roses from early summer to frost. The large flowers of 'The Lady Gardener' are a rich shade of pure apricot that pales towards the outside of the bloom in a halo effect. Over time, the color evolves becoming cream all over. The rosette-shaped flowers are full-petalled with a large button eye that gradually opens up. The petals are loosely arranged in a quartered formation. A strong performer in the garden, the variety stands up well to rain and stays very healthy. Its strong fragrance is particularly delicious: Tea rose with hints of cedar wood and vanilla. 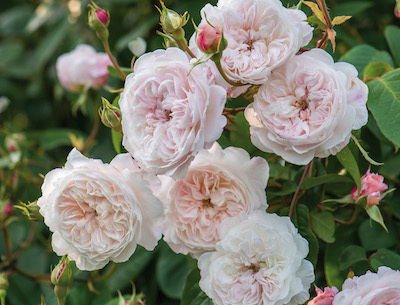 The Austin team considers ‘The Lady Gardener’ one of its all-time best repeat-bloomers and has added it to their list of Most Fragrant English Roses. Details: Repeat-flowering. The fully double flowers are 4-inches in diameter with approximately 65 petals each. Grows to 3-4 feet tall x 2½ feet wide, depending on how it is pruned. Hardy in USDA Zones 5-9. 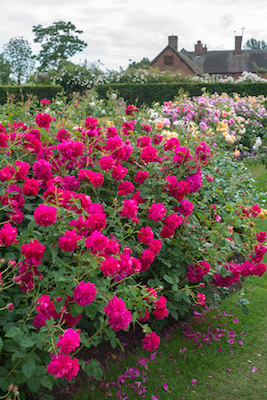 ‘The Albrighton Rambler’ -- Rambler roses that repeat-flower from early summer to fall are coveted, repeat-bloomers bred for shorter climbing lengths even more so. 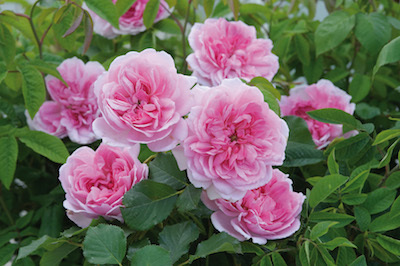 In spring 2015 David Austin introduces ‘The Albrighton Rambler’, its third repeat-flowering rambler sized up to 10 to 12 feet. The flowers open as a soft pink that pales to blush. Its perfectly formed, small cup-shaped blooms have beautifully-arranged petals centered on a little button eye. The blooms are held in large sprays and hang gracefully. It is an exceptionally tough, healthy variety that thrives with little attention and has few thorns. Its flowers stand up well to rain. On upright structures ‘The Albrighton Rambler’ mixes beautifully with large-flowered climbers. The fragrance is light and musky. Austin’s three short, repeat-bloom ramblers have lax arching stems ideally sized for use as climbers on arches, pillars, walls, trellises and even small trees. (All ramblers are known for more lax or pliable stems, but longer ramblers have a tendency to overwhelm many garden supports.) The lovely new pink variety joins Austin’s soft yellow rambler ‘Malvern Hills’ and white ‘Snow Goose’. All three are exceptionally pretty, reliably producing waves of flowers all season long. Details: Repeat-blooming. The fully double flowers are 2½ inches in diameter, with approximately 85 petals each. Grows to a height of 10 to 12 feet, perhaps a bit more in warmer areas. Hardy in USDA Zones 7-10. ‘Thomas à Becket’ – This beauty is a very different character from other English Roses. In ‘Thomas à Becket’ we see an unusual Austin rose with the natural shrubby growth habit of species roses. Its large flowers complement this look beautifully, with a more relaxed version of the distinctive cup-shape associated with hybridizer David Austin. The individual flowers are lovely. They open as informal rosettes, arrayed in a shallow cup. The petals quickly reflex as the flowers mature. They are held in medium-sized heads, the individual blooms nodding attractively on the stem. Flowering begins in early summer, a week or two later than many roses. But the bush soon roars to life producing masses of blooms for the rest of the season. The unusual red color evolves in a way that is difficult to describe or even photograph, opening as a light red that pales to carmine red. It is spectacular planted in combination with nepeta, geranium, gaura or verbena and other perennials and also with flowering shrubs. This variety is best used where an informal shrub is desired. It is a particularly strong and healthy variety and can handle a bit of shade. Its fragrance is Old Rose with a strong lemon zest character. Details: Repeat-flowering. The double flowers are 4-inches in diameter with approximately 65 petals each. Grows to 4 feet tall x 3 feet wide, or more according to pruning. Hardy in USDA Zones 5-9. ‘Maid Marion’ – The clear pink flowers of ‘Maid Marion’ open in the most perfect rosette-shape in the form of a saucer, framed by larger outer petals that form a beautifully rounded rim. David Austin’s team enthuses that the rose produces some of the most superbly formed flowers they have seen. It’s quick to re-bloom, producing wave after wave of flowers from early summer till frost. Its fragrance starts out as a soft myrrh that evolves over time to become more fruity with a distinct clove character. Details: Excellent repeat-flowering. The double flowers are 4-inches in diameter with approximately 55 petals each. Grows 3 feet tall x 3 feet wide. Hardy in USDA Zones 5-9. The David Austin Roses breeding program focuses on garden performance, including health and disease resistance, romantic color and fragrance, season-long blooms and attractive foliage. Once a breeding candidate satisfies these initial strict criteria, it must then pass the hurdle where its overall charm and beauty determine whether it has ‘the magic’ required to become an official David Austin English Rose. The process is rigorous. From an initial pool of approximately 250,000 candidates, reviewed over an eight to nine-year selection procedure, only a few are selected each year for introduction as English Roses.